‘작은 여왕’, ‘소화데레사’라는 애칭으로 널리 불리우는 데레사 성녀는 프랑스의 알랑송에서 시계 제조업자 루이 마르탱과 젤리 궤렝의 딸로 태어난 그녀의 원래 이름은 마리 프랑스와 테레즈(1873-1897년)였다. 1888년 아직도 어린 데레사는 리지외에 있는 가르멜 수도원에 들어가 평범한 생활을 하였다. 9년 동안의 가르멜 생활은 다른 자매들과 견주어 볼 때 독특한 면은 없었지만, 일상적인 기도와 일, 자만심에서 기인한 과오, 극복해야 했던 고집스런 성격 및 내외적인 갖가지 시련을 하느님의 사랑 안에서 그리고 그 사랑을 위해서 ‘작은 길’을 용감하게 개척하며 전진해갔던 것이다. 그녀는 24세의 일기로 선종했지만, 자신의 어린시절을 기록한 ‘한 영혼의 이야기’는 데레사가 비범한 한 거인이었음을 증명하였다. 她曾说过美国是世界上最贫穷的国家,的确,精神的贫穷胜过物质上的贫穷,只有拥有高尚品德的人才识最最富有的,DO YOU AGREE WITH ME ? I used to live in East China Normal University. Now I have been in Canada for many years. Thank you so much for writing this blog to Chinese. So few Chinese know about Mother Teresa. I had a personal encounter with Jesus Christ in Canada a few years ago. 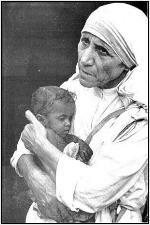 I have met many people like Mother Teresa in Canada. Just like what Mother Teresa said, there is no greater joy to live in the love of God. I understand the depth of my sins, and the joy of forgiveness from God. Thank you for posting this blog.